Ye. It should give you 0.85~0.9Q. I get the feeling that the Cookie Master version I'm using doesn't really calculate BCI that well though, because it's telling me that my ACs are kinda crap at the moment. Unless I'm interpreting it wrong. Which seems likely. I dunno. You have probably just bought too many in the push for the achievement and the upgrade that they cost too much compared to the other buildings. Just wait for the other buildings to catch up to the condensers. The upgrade is the only thing that matters, not the ACs. Selling all my buildings, buying chocolate egg, and resetting for over 500k HC. That's a pretty good milestone I guess. Then I will proceed to go for 200 AC this run. I'm still working on 200 Antimatter Condensers. I'll reset soon, I haven't reset since the Easter update so I've got a few more "Reset your game with X Baked achievements waiting for me. Bicentennial is still a long way off. Decided I would reset once I got to 1M HCs, so I'm gonna go for Bicentennial now. Here goes nothing! I'm up to 156 Prisms now. At this rate, 14 prisms in the last 10 minutes or so, I'll be done in the next hour. That's extrapolation for you! EDIT: By my rough mathsing, I need to spend just over 667Sx to get 200 prisms. Which is slightly more than my all time baked. Ouch. 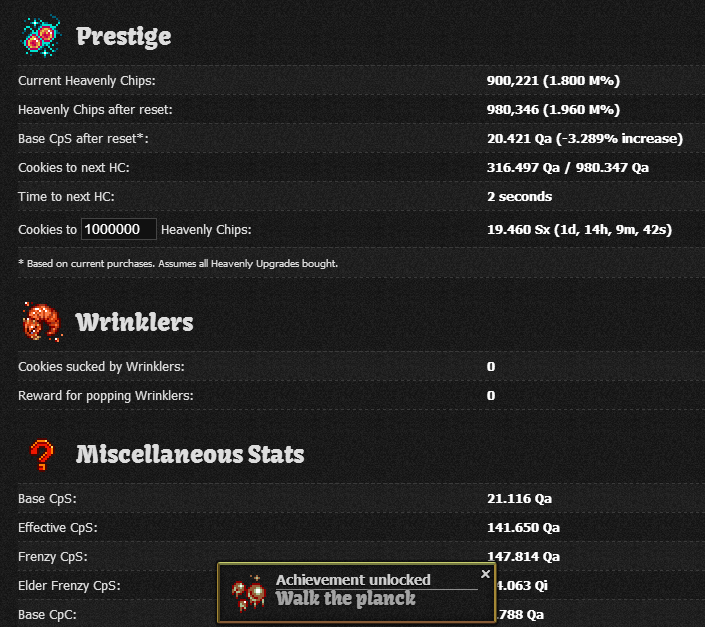 Hmm, maybe when I hit 1.2-1.5mil HC's, I'll actually go active in an effort to hit Bicentennial. Just got a good reminder of how much activity can affect a run. Actually played for an hour straight and had the final Kitten upgrade within that time, which is damn nice considering when I'm strictly Idling(after I buy up to like 125 prisms or so and 200 of everything else except tm's and ac's) it takes me about 15-18 hours to get enough to buy it. I'll probably hit the necessary cookies baked for 700k chips a full day ahead of time just because of that one hour played, and if I actively play another hour or two would probably cut another day off(since I"m now at my steady cps(well, close. At 11quad, I should cap out around 14quad this time around). I thought that Legacy started number was the session time at first. Then I realized it wasn't, and I feel so slow! lol. I have 6 more prisms until I get Centennial and a Half, and then I'll do my 5th reset soon after that and get a huge HC boost from my current 5k. On the topic of this thread, earlier I was planning to get Bicentennial after my 5th reset, but I hadn't done the math or looked up how many cookies it would take, so maybe I will do one more reset before I go for Bicentennial. It will depend on how good the Kitten Managers are. Just got a good reminder of how much activity can affect a run. For those interested, I'm 57 hours into my Bicentennial run, and have 195sx cookies baked. 1.5M HC, 200 AC, 189 Prisms currently. Playing with One Mind, vanilla game. Still on target for finishing up at mid-late next week. So an 8-10 day run is my goal. Wow I'm envious you have 195sx with only 57hours! I'm doing my bicent run now too but with only 1.0m HC. I'm 195 hours in and have 353sx baked. My math tells me I have 8 days left if I average 10eldeer per day (full wrath). I keep wondering if I should reset (to 1.3m hc now) but my math tells me it takes less time if I just stick it out this session. (8 days left on this session vs 12 days if I reset now) Does anyone have advice on this point? Aureliano (or anyone else) why do play One Mind versus Full Wrath? Do you still synch deer? What do you like about it? I've been thinking of doing a One Mind session but I like my eldeers so much and hate how wrinklers take forever to respawn, especially if using wrinklers to help get eggs. I keep wondering if I should reset (to 1.3m hc now) but my math tells me it takes less time if I just stick it out this session. (8 days left on this session vs 12 days if I reset now) Does anyone have advice on this point? Tough call. I was faced with the same issue. It really comes down to balancing out your preferences at this point. You can either have bicentennial sooner, or cope with the boredom. You will also want to keep the session going for a while after reaching bicentennial, so that's another several days right there. I'm currently at 384k HC's with 102 sextillion baked this game and 175 sextillion baked all time. Should I reset with 185 Prisms? I feel this may take awhile if I don't reset. 1. One Mind doesn't rely solely on pure luck. 2. Of course I sync deer, it's piss easy with Golden Goose Egg. 3. You still get eldeer in One Mind. I play One Mind, I don't sync deer (I still do get an Eldeer once in a blue moon), I like getting Lucky and Click Frenzies, I only use GCs for the eggs, and I'm half ignoring the Halloween cookies now (I still switch to Halloween when I pop wrinklers, but now I only do it once per 24 hours until I have all eggs/cookies). Does anyone have advice on this point? why do play One Mind versus Full Wrath? Do you still synch deer? What do you like about it? I've been thinking of doing a One Mind session but I like my eldeers so much and hate how wrinklers take forever to respawn, especially if using wrinklers to help get eggs. One Mind. I absolutely adore the FCF, even if they are rarer than Eldeer in Full Wrath. Assuming I get most of the full time amount, I make much more than an Eldeer alone (Eldeer gives me 2.9sx, plus clicking and Wrinklers; FCF gives about 4-5sx if I catch most of it). It's relatively rare for me to get so much in such a short time, but about 25% of my total cookies have been from clicking so far. And Frenzied Luckies? Common, and those 300+ quints always bring a smile to my face. It's also wonderful to see your deer giving 30+ quint instead of a Ruined 2qi. Plus, you still get Eldeer! Rarely, but they do happen. And yes, I sync the deer. It's pretty easy once you have the Golden Goose egg (which was one of the earliest rare eggs I got this run; yessssss!). My sole issue with One Mind versus Full Wrath was the wrinkler respawn rate back when resetting your browser would clear your Wrinkler cookies if you had over 1sx total. The latest patch fixed that issue, so now I only pop them once or twice a day, for a massive payoff. The constant Frenzies don't hurt either when it comes to Wrinklers. I ignored the Halloween and V-Day cookies this time. They have such a small effect, and since I plan on playing for around two weeks I prefer to keep season switching costs as low as possible for Christmas. Really? I was under the impression that when a season runs out now it reverts back to Easter, not Valentine's Day. Something to keep an eye out for tomorrow, I suppose! Edit: Oh, I see what you mean. My issue as listed above is that, since switching seasons increases the price each time, I prefer to just play perma-Christmas since I found all my important eggs already. You get about 37 season cookies before they start costing into the sextillions. 182 Prisms at the moment :O And about to head off to work. I am having an absolutely disgusting run of good fortune in this run; I had FIVE FCFs in two three hours yesterday, and 3 normal CFs. Already had three Eldeer today, two FCFs, and several CFs. Question for those more mathematically-inclined than I: at what point does it make sense to save up a bank to get a great bang for the buck with the Chocolate egg? The last Prism, or earlier?